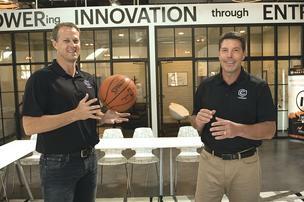 eCoach’s Collier Mills, left, director of operations, and Rich Hempel, CEO and co-founder, have the sports technology company poised for growth after signing a deal with the NBA coaches association. It doesn’t get much bigger for a high-tech sports startup than to sign a deal with the NBA coaches association. Northern Kentucky-based eCoach just got its big break by finalizing a contract to provide instructional videos from all 30 NBA coaches, a move that could send the startup company on a skyrocketing growth track. China has 300 million basketball players, which is roughly equal to the entire U.S. population. The deal with the National Basketball Coaches Association – the labor association for NBA coaches – offers worldwide exposure, so eCoach can tap into the growth of basketball in Africa, India, Europe and elsewhere. eCoach provides video coaching tools, private lockers and its own premium content that youth coaches can use to communicate with their players and teach them. He compared it to online education. Coaching is really teaching, so he figures it makes sense this business will shift online, too. eCoach also can connect young athletes with top private coaches, which is something that’s largely available now only for a small number of athletes and typically at a relatively high cost. eCoach’s subscriptions start at $6.99 a month. They vary according to the level of coaching and content. Former Major League Baseball player Chris Burke is a co-founder of the firm who happens to be a top-notch baseball instructor for all levels, Hempel said. Former NFL quarterback Trent Dilfer is involved with the company. And now the NBA coaches are on board. Hempel, a former IBM employee who has been involved in a number of technology startups, knows how that system works. He has two kids who played or play Division I sports as does co-founder Ken Jackson. Hempel’s kids went to Ryle High School. His son, Conner, was a quarterback at Harvard. His daughter, Harper, plays volleyball at the University of Kentucky, so it was natural that Hempel and Jackson launched the company about four years ago to help kids get top-notch coaching. “I’ve gotten to see firsthand how sports can change a young person’s life,” he said. Jim O’Brien, an assistant coach for the Philadelphia 76ers and former assistant at the University of Kentucky, came to eCoach with the idea. He had been traveling globally to run clinics and realized there had to be a better way to do it that didn’t involve as much travel. eCoach’s deal calls for it to create, distribute and sell the NBA coaches’ teaching expertise around the world. eCoach has about 10 full-time-equivalent employees, Hempel said. It will add people as a result of the NBA coaches deal and the firm’s growth. The company will also look at various options to raise its next round of capital, he said. So far eCoach has been financed through investments from private investors. Hempel knows his way around the local startup community. He launched his first startup almost 20 years ago. That was A.F. Kelly, a tech consulting and services firm. He has started several companies since then. He’s also heavily involved in the local startup scene, serving on the board of the Kentucky Innovation Network and being involved with startup support groups CincyTech and Cintrifuse. Hempel said the local startup community has evolved tremendously over the past decade. His technology team is local; the firm uses local branding firms, law firms and financial advisers and has gotten input from groups like Cintrifuse and the Kentucky Innovation Network.